In the previous installments of this series of posts, I’ve argued for Jesse Sanders, Marcus Denmon, C.J. McCollum, Jae Crowder, Kevin Jones, Ricardo Ratliffe and William Mosley. 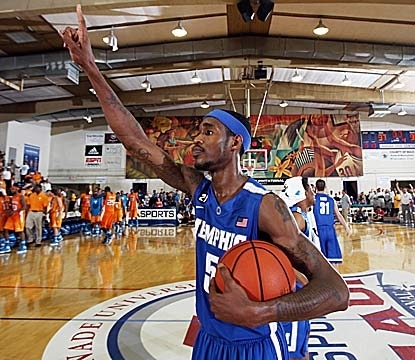 This time I’m arguing for Memphis swingman Will Barton. Another Star Late in the First? Barton’s Stats vs. Average NCAA Small Forward and Top 100 Draft Express Small Forwards. All Stats are per 40 minute. Barton is twice as productive as the average shooting guard prospect in Draft Express’s top 100 – and he’s only a sophomore! His shooting percentages are very good, though he needs work on his long range ability. He is above average nearly across the board, but what really seems to separate him from his peers is his rebounding. Barton, a small forward in college, grabbed more rebounds per 40 minutes than the average college center! It’s also important to note that Barton took pretty good care of the ball considering his age and role on the team. In addition, Barton is a legitimate 6-5 with no shoes on – taller than Jae Crowder! – and has a wingspan of over 6-9. Not that height is that big of a deal, but I want to point out that he is the one underrated prospect I’ve covered that isn’t “undersized” for his position. So What’s the Problem With Barton? [Barton’s] decision making can still be shaky at times, his skinny frame may limit his ability as a finisher, and … he still needs to prove he’s capable of being a reliable perimeter shooter with his feet set. Ok, these are some legitimate concerns. Well, except for the strength one. I never got that. “He’s really, really good, but he’s not strong enough.” Ok, well when he plays basketball PROFESSIONALLY, the team’s trainers can spend all the time in the world increasing his strength. And if he’s already good and he’s this weak, that just means he’ll be even better when the team’s trainers get him stronger. Really, to me, the whole “he’s not strong enough” argument went out the window with Kevin Durant. The dude couldn’t bench press 185 ONCE at the draft combine. Five years later and he’s a top 5 player in the entire league. Still, concerns about Barton’s long range shooting ability and poor shot selection are legit. If he really does have a poor shot selection, maybe it’s not best for him to be drafted to a bad team that will ask him score a lot right away. As we know, NBA general managers and media pundits don’t care that much about shot selection. If Barton scores over 20 points per game, even if it takes him 30 shots, he will be treated – and paid – like a star. But if Barton can get to a spot where he scores a little less on a lot less shots, he actually will be a star. Indeed, Barton’s future productivity might well depend on who drafts him. Here’s a scary thought: there’s a good chance this guy goes to the Bulls. Yes, Chicago has Ronnie Brewer, who is really quite good. But he seems to get a good deal of playtime backing up both Hamilton and Deng. The real problem is that Hamilton gets significant minutes at all. If Barton is eased into Hamilton’s spot, it good be a great situation for both the Bulls and Barton. The Bulls get the best shooting guard in the draft. Barton goes to a place where he will not be expected to be a main scorer, and learns to improve his shot selection. Everybody wins. Except the rest of the NBA. The chances of NBA decision makers reading these articles are small. The chances of them taking my advice are all but nonexistent. But if some of these players end up in the league and pan out, maybe it will make people look at potential and college productivity differently with respect to draft prospect analysis in the future. Right now, far too much emphasis is placed on potential and size. Stats that capture possessions (and often carry over well) aren’t given their due. Again, it’s unlikely that any of the players I have covered in this series of posts will be superstars. That’s true of most players in the draft, even players picked in the top five. I think the odds the players I’ve reviewed could have fruitful NBA careers is better than the typical draft pick. Here’s hoping an NBA team gives them a shot. 13 Responses to "Underrated Draft Prospects: Will Barton"
I have Barton just out of the lottery on my big board, and I do think the Bulls get him. The only reason his lack of strength gives me pause is that he doesn’t have a three point shot. It seems as though potentially good wings become bad because they tucker out and start heaving threes. LeBron even does it. That said, fine, don’t blow the #2 pick on the guy. Letting him slip to the 29 is just stupid. lol. I’m now 100% certain we have the same spreadsheets. Let me guess your next 5 prospects. Mbakwe, Ken Horton, Andre Roberson, T. Zeller, John Jenkins. the mold. I will be publicizing my spreadsheets soon so you will be able to compare. Loved this series of posts! As a warrior’s fan, I’ll enjoy comparing how much worse the players we actually draft are to your picks. I would love to see your big board. I feel this draft is much weaker than people seem to believe. What’s your opinion on this draft in comparison to others? Any chance you could go back to previous drafts and go over similar players? Love these articles. @ryanshroud it’s not just a feeling. Aside from combo guard and Power forward stat production being slightly up, every other position is down. Center had a full 1 Position and Reb. adj.WS40 drop in production. Everyone else suffered a .5-.1 drop in prouction. This is not the draft to go pick a center in.